"If you've always dreamed of a super-effective way to lose weight that's so easy, it works automatically even when you cheat and skip workouts sometimes...this will be the most exciting letter you ever read." 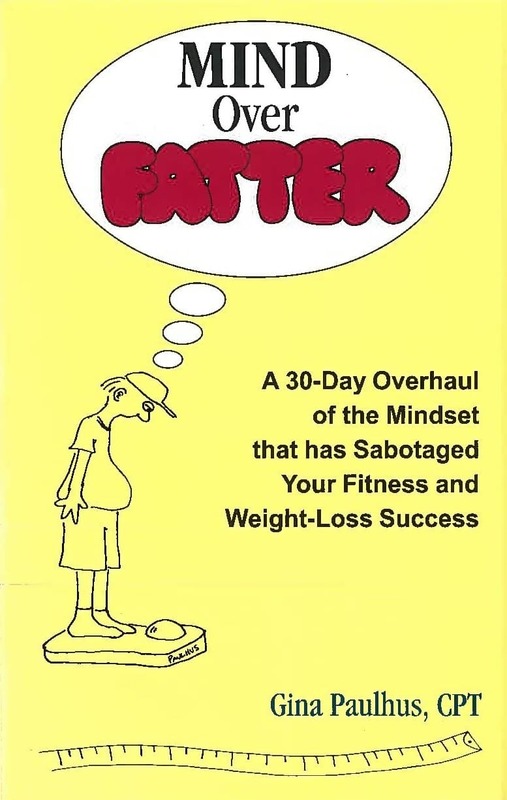 Go here for your ebook "Mind Over Fatter" for Kindle. My name is Gina Paulhus and I'm a Certified Personal Trainer who has helped 952 people to date lose weight AND keep it off. What makes that statement more noteworthy is the fact that virtually all of those people had tried and failed at losing weight in the past. They had tried diets and health club memberships and workout programs and have a shelf full of worthless supplements at home, but they still had every ounce of fat on their body that they started with--in some cases, even more. While some of these folks knew just a little about effective exercise and nutrition, others knew just about as much as I did, and this is what I do for a living! What they didn't know was how to put their "Mind Over Fatter" to finally execute their plan. And they didn't know the secrets only personal trainers know for how LESS can be MORE with exercise and nutrition. What personal trainers know that the general public doesn't is this: Cheating on a diet usually helps, not hurts, your results. But it's not just any cheating that will do. You need to cheat SMART. Also, people who skip workouts from time to time usually do BETTER than those who don't. But, again you need to be SMART about when you skip your workouts. Again, secrets personal trainers know. My colleagues think I'm crazy, (and I probably am)...but I don't care. I've let the cat out of the bag with my 30-Day System for Weight Loss and Fitness Success. I command upwards of $80 per working hour for my services...so WHY ON EARTH would I reveal these secrets to you? Please don't take this personally, but--I'm willing to reveal these secrets because I feel bad for you. I really do. I feel bad for everyone I see who is overweight, out of shape, and generally not his or her best. I can't live with myself knowing that I hold the key to another human being's happiness, and I'm withholding that. So I've removed the barriers to accessing personal trainer secrets that are usually reserved for the well-to-do. Look, I know you're on this web page right now because your body is not where you'd like it to be. Your pants are tight, you feel sluggish and bloated, you have rolls of fat where there were none before, or your arms do that dreaded "double wave." Chances are you've tried different programs with varying degrees of success. I think it's safe to say that, if they worked great for you, you wouldn't be here reading this right now. The fact of the matter is that there are more diet programs, diet products, weight loss supplements, fitness programs, and health clubs THAN EVER BEFORE...yet Americans are FATTER THAN EVER BEFORE. We get more formal exercise THAN EVER BEFORE...yet more Americans are FATTER THAN EVER BEFORE. We consume more diet products including artificial sweeteners THAN EVER BEFORE, yet Americans are FATTER THAN EVER BEFORE. What's going on? As far as I'm concerned, there are two main issues to blame for the fattening of America. 1. Diet and Exercise Programs by and large are a Band-Aid--they treat the SYMPTOM (excess weight) but not the CAUSE (a sluggish metabolism). Even if they work in the short-term, they typically aren't sustainable as a long-term solution for weight control, UNLESS THE UNDERLYING PROBLEM OF A SLUGGISH METABOLISM IS FIXED. 2. People aren't taping into the immense power of the mind to make a change in their lives. In fact, people let their mind work AGAINST them, making it HARDER than it has to be to lose weight and get in shape. As a personal trainer, I feel it is my civic duty to help people overcome these two main problems that are sabotaging their weight loss. I decided to create a weight loss System to teach people how to overcome them and easily achieve fitness and weight loss success. I knew this project had to be manageable for the average person to be able to take on, so I broke up the program into 30 easy-to-follow Strategies to ensure your fitness and weight-loss success. They are designed to be tackled one day at a time, so that the entire program can be completed in one month's time. Fill out this form for a Mini E-book with some of the chapters in Mind Over Fatter, for free! #21 48-hour rule: Leave that muscle alone! "Between family and work commitments and lacking motivation to get started, I haven't exercised on a regular basis for years, even though I've been meaning to for the longest time. Reading Mind Over Fatter made me want to get out there right away and exercise! After finishing each Strategy I couldn't help but move on to the next. The book clearly explains all angles, options, and potential obstacles a person can encounter when trying to get fit and fight fat. I've been exercising every day since I finished reading a couple of weeks ago, and I'm already feeling a difference." "Gina is super-knowledgeable, versatile, and extremely dedicated to the exercise field--in short, a true fitness coach who is committed to making sure you get results. Gina makes the process of getting in shape (or in better shape) enjoyable, doable and attainable. With her book's help, I was able to lose 14 inches and 14 lbs. in just 12 weeks--and stay committed to my fitness goals." "Do you want success guaranteed or double the pounds back? Gina Paolino is a motivator who will become your partner in developing an individualized program to success–-Guaranteed for life." "If you feel like you've tried everything to lose weight and get in shape and failed at each one, this System is exactly what you need because nothing is left to chance. It covers all bases, including the physiology of what works and what doesn't, mental and psychological aspects of training, and the planning, implementation, and adaptation of your program over time. Perhaps more importantly, it's inspiring, motivating, and fun to read. It really gets you excited about working out." Each 325 pg. book is just $19.95. We decided to price the book like a regular paperback for the first printing only as a market test. This System is MUCH more powerful than a typical $19.95 book with some advice in it, but we needed to get the book out into people's hands FAST to build some BUZZ surrounding the book. We have 500 books available for this price. This book comes with coupons for personal training and fitness coaching services and a 100% MONEY-BACK No-Questions-Asked GUARANTEE. If you decide that the book ISN'T worth your $19.95, simply return it whenever it's convenient for you, and KEEP the coupons for personal training as a "Thank You" for trying to put your "Mind Over Fatter." As if all of that weren't enough, this System also Includes some BONUS sections at NO EXTRA CHARGE. Each of these Bonus Articles are worth AT LEAST $9.95 all by themselves...and I'm including them ALL FOR FREE! --Just How Much Time is Required to Experience the Benefits of Exercise? --Progressive Resistance Cycle Training: A Systematic, Scientific Approach to Your Exercise Routine (Attention Advanced Exercisers! FINALLY bust through that frustrating plateau with these revolutionary techniques). EXTRA BONUS: Includes photos of Gina demonstrating correct form on some basic exercises. 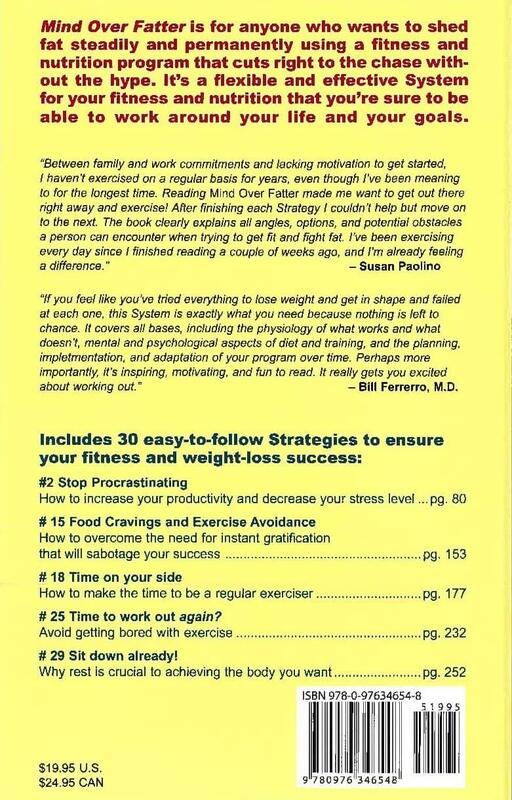 Here is How to Order a Copy of the Mind Over Fatter System on sale for 50% off. If you're still not sure this program is worthwhile, read about the lives Gina has changed with her sound advice.